Cress Funeral Service is known throughout funeral service as a leader in providing the highest level of service to their families. The ownership and staff are constantly searching for new opportunities to raise the bar on their level of service. This led them to explore how they could utilize email to supplement their aftercare and grief programs. Cress Funeral Service offers extensive support for each family during the arrangements and has a dedicated C.A.R.E team that is focused on meeting with families after the service to help with transitional care. In-person meetings with the C.A.R.E team are well received, but what about family members who find it more convenient to receive emails because of their location or scheduling conflicts? Delivering the right message at the right time into the inbox of the families they served was the objective. Providing a digital level of care equal to their in-person level of care would complete their company’s “Circle of Care”. “Many families prefer to communicate through email. If this is their prefered method of communication, we need to adapt to their needs. Delivering aftercare and grief resources through email allows us to personalize our level of care to them”, says Carey Cress-Fose, Vice President of Cress Funeral Service. 77% of the US population has a smartphone and is steadily increasing. If you think it is only millenials and younger, you’d be mistaken. 42% of the US population 65+ in age own a smartphone. As a result of owning a smartphone, each person also has a personal email address. It’s true that some owners don’t don’t open their inbox. However, an overwhelming majority of smartphone users are glued to their email. In many cases those who prefer email will not answer their phone, but immediately send you an email. Traditional practices of calling to schedule in-person meetings often do not work as well for these types of families, which results in lost time and efforts of staff. Instead of asking the family to adopt your preferred method of communication, it’s important to adapt to their preferred method of communication. “From personal use, I’m constantly checking my email on my phone. And I believe it is the same for many of our staff. It’s fair to assume that many of the families we serve are the same way. Their lives are busy, so we want to make sure we deliver our message as efficiently as possible”, says Bill Cress, President of Cress Funeral Home. The biggest concern of not finding a solution is that a family member goes without the aftercare and grief support that is needed to help cope with their loss. If a family member prefers email outreach, they may not schedule an appointment with the C.A.R.E team and as a result the valuable information will not be shared. In a growing number of cases, family members are remote and it is difficult to schedule meeting times. Having remote family members often limits the traditional services offered by Cress Funeral Service. Providing an email alternative to supplement grief and aftercare support also allows predictable outreach and extended support. In-person aftercare has limited support due to the time and overhead. Often a family member’s grief can last months or years. Not offering an email aftercare and grief solution leaves gaps in the healing process. Each person grieves on their own schedule. Without utilizing email, we run the risk of not guiding each family member through their grief journey. With email, we can be by their side for a year or more”, says Carey Cress-Fose. Another risk of not offering email aftercare and grief support is that it opens up an opportunity for competition. If a family member is looking for email support and you don’t offer it, they will most likely find it elsewhere. If a competitor of yours offers an extensive email aftercare and grief program that the family member enrolls in, it exposes the family you served to the competition and opens the door to building trust and loyalty. Our team at Funeral Innovations worked with the staff at Cress Funeral Service to deploy an email solution to provide immediate support for the family, along with ongoing grief and educational materials. It was important that all emails came from Cress Funeral Service’s brand to ensure it appeared they were sending every email. In addition, if a family replied the email went directly to the Cress Funeral and Cremation Services staff. “Continuous Care” aftercare email series to guide the family through the transitional care, plus targeted emails on special days. “Hope After Heartache” grief series offers ongoing outreach and support. Monthly newsletter: provides endless support and education. Each family member was asked for their email address during the arrangement process. Families who opted into the email series were added to a dedicated aftercare email series titled “Continuing Care”. The “Continuing Care” series focused on helping each family member with reminders of important tasks following the death of their loved one. 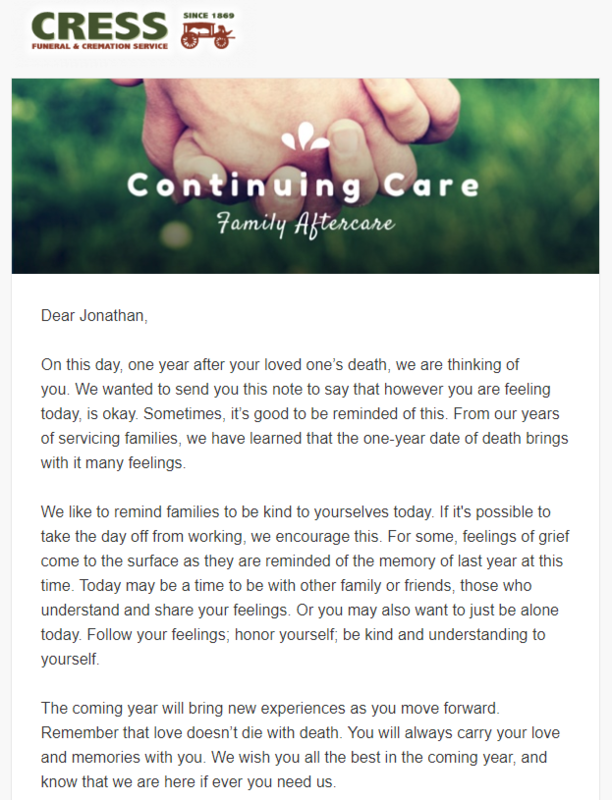 This email series was sent out a day after the funeral service and looked as though it was a personal email sent by the Cress staff (although it was fully automated). The example below highlights the Benefits and Financials Care Guide. Included in the email is an attachment with scripts for the family member to use, along with helpful information. The example below is the message sent on the one year anniversary of their loved ones passing. If a family member enrolled in the “Continuing Care” series, they automatically become enrolled into the “Hope After Heartache” grief support series. As an alternative, family members could also be subscribed only to the “Hope After Heartache” series. Through 10 professionally crafted emails, this series focused on timely grief support outreach to help each family member through their grief journey. When a family member is added to the “Continuing Care” or “Hope After Heartache” email programs, they are automatically subscribed to the firm’s monthly newsletter. The monthly newsletter delivers educational and informative topics to their inbox. Email newsletters are a great way to extend your level of service well beyond a year to keep in touch with the family member and deliver help and guidance. Below is an example newsletter titled “Why the Holidays Are Not Always Jolly”. This newsletter was focused on providing grief support during the holidays. One of the unexpected hurdles of rolling out the email strategy outlined above was getting Cress’ staff to buy into the vision. There was hesitancy in asking the families they serve for an email and concern with the content that was being delivered. We overcame this challenge by educating each staff member why the email program was so important and allowed them to review each email that would be sent out. The end result was getting each funeral director to join in the initiative. The biggest lesson learned is that email outreach deserves a spot in any funeral home’s aftercare and grief support. It’s isn’t for every family, but those who prefer email communication will be forever grateful. It provides a soft touch and allows you to be there when they need it most. Please contact us if you are interested in learning more about this case study, or how email outreach can help raise the level of service of your firm. The Email Outreach program is part of the Premium and Elite levels of our Growth Engine.